Yep. Orange. We knew we wanted a pop of color in the space, since the only other color in there is the original stained glass window. See that little dot at the bottom? That is a deep orange. And for some reason, it just speaks to me. So when we started looking at all of our color options for the ovens, I mentioned maybe thinking about orange. And Charming Suitor loved it! One, it is a wonderful rich color that goes beautifully with the full range of grays and browns in the space. Two, it is a bold decision, and we like to think we are a little bit bold. 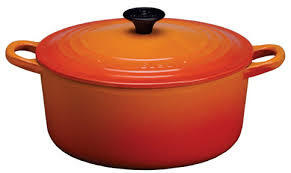 And three, while we love all of our Le Creuset pots and pans in all of their variety of color, it is that classic flame color we love the most. So we knew it was a color we would never get tired of! Stay tuned for later this week, there will be a BlueStar update with pics of the actual appliances! Carolyn, send me both your mailing address and your email address and your copies of Recipe for Disaster and Big Delicious Life will be on their way to you! staceyballisinfo (at) gmail (dot) com. For the rest of you, what color would you pick for your BlueStar oven and why?